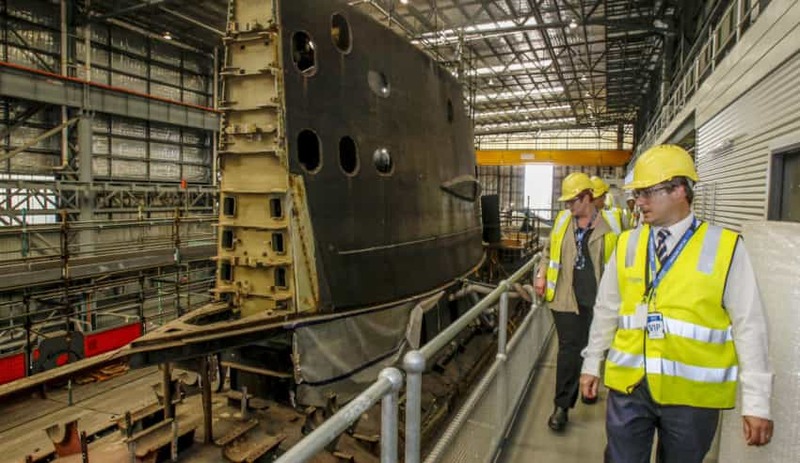 Maitenance progress of HMAS Collins in the Submarine Full Cycle Docking Production Hall at ASC Adelaide. Despite concerns that a talent shortage of naval engineers and architects could cripple the industry, Australia’s sovereign shipbuilder ASC is seeing an increase in the number of students undertaking the master’s of maritime engineering program at one of South Australia’s leading universities. As previously reported on Defence Connect, the University of New South Wales (UNSW) suspended its intake for naval architecture under the bBachelor of engineering degree this year, with the course under review for possible closure, ahead of Australia's largest naval upgrade. A spokesperson for UNSW said the decision to suspend the course was largely due to the lack of student interest. The suspension has left only the University of Tasmania, through its partnership with the Australian Maritime College, as the only undergraduate degree in naval architecture in Australia, while students at other universities, such as South Australian-based Flinders University, are only able to undertake a bachelor of engineering (maritime) through collaboration with the Australian Maritime College in Tasmania. Spokespeople for primes in the shipbuilding industry told Defence Connect they are not currently experiencing a shortage of Australian naval engineers and architects, but some have argued more must be done to prevent a decline of Australian talent in the industry. The master's course, offered at the University of Adelaide and delivered by ASC, is the only course in Australia in submarine design and is delivered exclusively by ASC experts in submarine platforms. Two years ago, when the submarine course was last offered, there were just nine master's students. But this year the figure has increased to 27. ASC, the builder and maintainer of the Collins Class submarine fleet, and the University of Adelaide are confident the increase in numbers reflects the place Adelaide will occupy at the centre of submarine and major warship design and construction in coming decades, under the federal government’s plans for the industry. "ASC has the people and expertise to not only help build the RAN’s future platforms but also to develop the skilled workforce required for the planned continuous build of naval platforms in coming decades," said ASC interim chief executive Stuart Whiley. Master's course co-ordinator and ASC’s Future Submarine capability manager Eric Fusil, a certified naval architect, said ASC was well-placed to provide expert delivery of the master's-level courses. "As the builder and maintainer of Australia’s Collins Class submarine fleet, and the shipbuilder for the Air Warfare Destroyer program, ASC draws on its expert staff to support the delivery of this valuable course material. We’ve seen a surge in enrolments this year from Defence personnel and defence industry, reflecting the build-up in future submarine and shipbuilding programs launched by the federal government and to be rolled out in the next decade," said Fusil. "This year we have 27 students enrolled in the introductory submarine design course, receiving a day of lectures a week for 12 weeks. The first semester is soon coming to a close and the students will then continue for a second semester at a deeper level of detail." The University of Adelaide’s director, defence and security, Professor Michael Webb said, "These marine engineering programs are addressing the need for highly-skilled design engineers needed under the Australian government’s $89 billion investment in naval ships and submarines – a small but essential part of the 5,000 personnel needed overall." Throughout the course, each student completes an individual project developing a submarine concept design using professional tools. ASC has 11 internationally recognised subject matter experts delivering the lectures. ASC’s lecturers have worked on the design, build and maintenance of more than 10 different classes of submarines worldwide, from UK, France, Spain, Sweden and Australia. "It is an incredible wealth of real-life experience in terms of submarine engineering that the students can draw from," said Fusil. "Having access to this breadth of expertise is a real eye-opener for any submarine engineer serious about the business. It is no wonder that we now have international students enrolling into the course, as well as inquiries from overseas companies about our availability to train employees in that field." ASC supports numerous university scholarships and university-level research projects in submarine and naval shipbuilding disciplines, including on innovation projects to improve the productivity of its shipbuilding and submarine operations. In addition, ASC also seeks to support high school students by offering financial support and mentoring through the Subs in Schools program, to develop STEM skills and support for the Defence Industry Pathways Program (DIPP) for year 10 and 11 students and develop the trade and technical skills required by ASC Shipbuilding on its current and future projects.